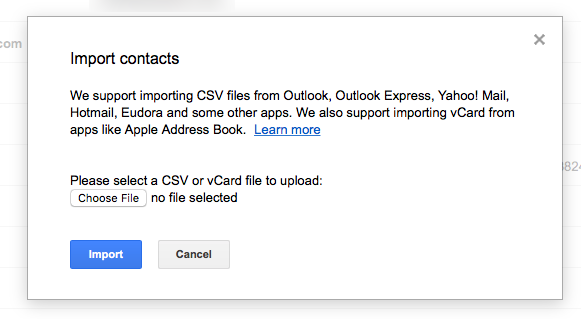 Google Contacts makes importing a bit easier, at least from its older version. Just open Google Contacts at contacts.google.com, and tap the Go to the old versionbutton on the lower left (or click here to directly open the older version. In the menu there, click More then select Import. You can then import a .csv file of your contacts—the format most email and contact apps will use to store your contact file. If you've kept your contacts in a spreadsheet, you can import that just as easily. You can also import individual vCard contact files—but a spreadsheet import will be the fastest.